Same color. Two different looks., a photo by Roberta Warshaw on Flickr. My experiments in color continue. I think I may never be done with this phase of experimentation in polymer clay. 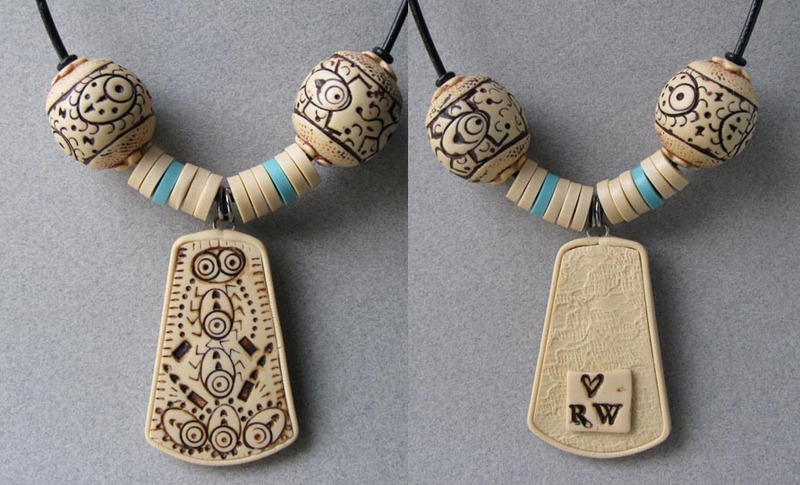 Both of these sets of beads were made using the exact same ivory color mix from Lynda Moseley's Faux Ivory tutorial. The only difference being the colors that surround them. In the top photo, copper pearl ex was used as well as a coppery mixture I created using alizarin red and a bit of gold. Varying the amounts of gold gives a wonderful variety of copper colors to choose from. In the lower set, I used carbon black pearl ex. Warning: a little carbon black goes a very long way. I am still learning how to control it. The top beads look almost like porcelain. They remind me of lamp finials. More Faux Ebony and Ivory beads, a photo by Roberta Warshaw on Flickr. I hope everyone had a lovely holiday weekend and that you didn't eat too much! On Black Friday I did what I always do. Stay home. I have no desire to go out to the stores and deal with the crowds! I bought another wonderful tutorial from Lynda Moseley. I cannot sing Lynda's praises enough. Her tutorials are fabulous. This one is called "How to Create Fabulous Faux Bone and Ivory." In this tutorial she includes 8 faux bone recipes and 3 faux ivory recipes. I haven't yet started on the faux bone yet but I will soon enough! The beads you see in this photo are done with one of her signature faux ivory mixtures. It is a really lovely color and quite translucent which you may not be able to tell from the photo. But trust me it is a wonderful color. I find myself enjoying repeat patterns. I think it must be related somehow to my years as a graphic designer when I would have to create borders for text books and other graphic elements. A good friend of mine used to design textiles and I was always amazed at the way she could see repeat patterns in her minds eye. It is an acquired skill. Me, I am still quite surprised when I sand away the excess pearl ex to see what my design will look like. it is very exciting to sand it off to see what lies beneath! I never liked sanding until it meant a big reveal! Now I find myself sanding away! Although I still need to be careful of my repetitive stress from sanding. My holding hand gets very cramped. It was one of the reasons I stopped enameling. The sanding was killing me! Don't ask............, a photo by Roberta Warshaw on Flickr. Happy Thanksgiving from my beads to yours! These were an accident of course. But they are funny! Set of 5 heart beads, a photo by Roberta Warshaw on Flickr. I love the way these look all lined up like this! I am enjoying this bead series immensely. There are so many things I can do in order to make each one unique, whether it is the design itself or the color of the clay. Using different colors of pearl ex adds it's own unique quality. I recently read on one of the blogs that some polymer artists use Renaissance Wax on their pieces. I did try it but found the smell was overwhelming. I am very sensitive to smells and have many allergies. I also found that it didn't really make the beads that shiny after polishing. So far I have found Armoral to work best for finishing my beads. I brush on a light coat and burnish it with a cloth. It gives the work a lovely sheen and it doesn't smell at all. Turqouise beads, a photo by Roberta Warshaw on Flickr. Yes, these two beads are made from the exact same turquoise color formula. yet notice how different they look from each other. The scribing on the left is embellished with a blue/gold pearl acrylic paint. The scribing on the bead on the right has been embellished with bronze pearl ex. Also the bead caps are made with a faux ivory color on that one. I am always amazed at how colors react with one another. It is a constant and mesmerizing study and one I never tire of. mexican design #3, a photo by Roberta Warshaw on Flickr. Lately my work in polymer clay has been feeling vaguely familiar to me. Now I see why. This is from a series of Mexican gouache paintings I did circa 1987-1990. At the time I was living in upstate New York and would get into the city often to visit the museums. I happened to see a wonderful show on ancient Mexican art and artifacts and many, many paintings were inspired by that visit. You can see where my love of repetition of lines and forms has followed me into my polymer clay work. It is interesting to see how the medium may change but the ideas do not. The style follows throughout. It is fascinating since I have always believed that we have no control over our style. It is like our fingerprints.